Hospitals Supporting Healthy, Local Food? Thanks, Obama. New language in the Affordable Care Act asks hospitals to join in the fight for food access. In the Bell Hill neighborhood of Worcester, Massachusetts, Ana Rodriguez walks door-to-door, inviting residents to host a backyard garden plot or volunteer in one nearby, and share in a bounty of local produce at the end of the season. But Rodriguez doesn’t work for an urban farming nonprofit; she represents a nearby hospital. Bell Hill, which sits two blocks from UMass Memorial Health Center, where Rodriguez serves as a community liaison, is home to a population that has traditionally struggled with food insecurity and a host of diet-related diseases. With the help of the nonprofit Regional Environmental Council, the hospital has funded and promoted the construction of more than 14 backyard gardens (with a lengthy waiting list) since 2013. UMass also supports a mobile grocery that brings fresh, subsidized produce to its low-income neighbors, and is helping put together Worcester’s first local food hub. UMass Memorial’s collaborative, long-term plans to improve food access in Bell Hill are being implemented, in part, as a result of Obamacare—even as an upcoming Supreme Court decision imperils the 2010 health care overhaul. Under the Affordable Care Act (ACA), all nonprofit hospitals must develop a Community Health Improvement Plan to keep their tax-exempt status. The ACA requires these institutions to work with community groups and other stakeholders to complete community health needs assessments every three years and to craft a plan based on the needs they find. Although this language was only made final in December, the spirit of the rule has been in effect since shortly after ACA passed. And it’s working. Monica Lowell, vice president of community relations at UMass, says the plans that have emerged from the hospital’s health assessments since the ACA’s passage have been “more integrated, more robust, and with more buy-in” than ever before. Now that the ACA specifically mentions nutrition, it may spur more hospitals to follow the lead of UMass and others that are going beyond reactive services to prevent diet-related illnesses. A report released last month from Health Care Without Harm, found that more than half of the nonprofit hospitals in Massachusetts are already engaged in expanding food access in their communities. Other data shows hospitals from coast to coast taking a renewed interest in improving public health by fixing local food systems. These hospitals are getting involved with local food policy councils, investing in healthy meals programs, running their own farmers’ markets, and subsidizing Community-Supported Agriculture (CSA) subscription services, nutrition education, and veggie prescription programs. While the U.S. is behind other developed countries in this area—Denmark has had preventative care codified in national law for more than a decade—the initiatives encouraged in the ACA come at a crucial time for us: nearly 80 million American adults are considered obese, their collective medical expenses costing close to $150 billion annually—$1,400 higher per person than non-obese individuals. In addition to the health cost to patients, diet-related illness costs health care institutions and insurance companies a great deal of money. Researchers estimated in 2009 that illness related to obesity resulted in $40 billion in increased medical spending between 1998 and 2006. Diet improvements can bring these costs down. A 2013 Union of Concerned Scientists report found that if Americans increased their consumption of fruits and vegetables just a little, health care costs for the treatment of cardiovascular disease alone could fall by $17 billion nationally. “Addressing the community food environment and improving not only access to calories but access to healthy food is a win-win all around,” says Dr. Jennifer Obadia, a food systems consultant who researched and authored the Massachusetts report for Health Care Without Harm. Obadia adds that the changes in the ACA have excited the food community and led some hospitals to refocus their efforts, but that it is still too early to know how the law will shift practices. Since 1969, the federal government has required nonprofit hospitals—which comprise 51 percent of hospitals—to devote a portion of their spending to efforts that directly benefit the communities in which they operate. Many hospitals insist their concern for nutrition and food access dates back decades. In practice, though, up to 95 percent of hospitals’ community benefit spending has gone to help low-income patients pay for care. Now, some of that need is being addressed by expanded coverage under the Affordable Care Act, which leaves more of the funding pie left to address preventative health, and healthy eating. Lack of access to healthy food plagues many communities, Obadia says—and health care institutions are answering the call. But collaboration is also key. In its backyard gardens program, UMass Memorial funds the building and materials for the garden beds, which are put together by students from a local vocational technical high school and the local carpenters union. The city chips in the soil, which is tested by the Regional Environmental Council (with funding from the hospital). Health center spokesperson Kimberly Reckert estimates the neighborhood could see 25 new gardens in 2015. Inside the hospital, UMass Memorial is paying renewed attention to the quality of the food it’s serving in its cafeterias, offering cooking and nutrition classes, discounts at the local mobile farmers’ market for SNAP recipients, and a seat at the table at local food policy council meetings—which actively discusses opportunities created by the ACA. There’s promising food systems activity happening elsewhere as well. 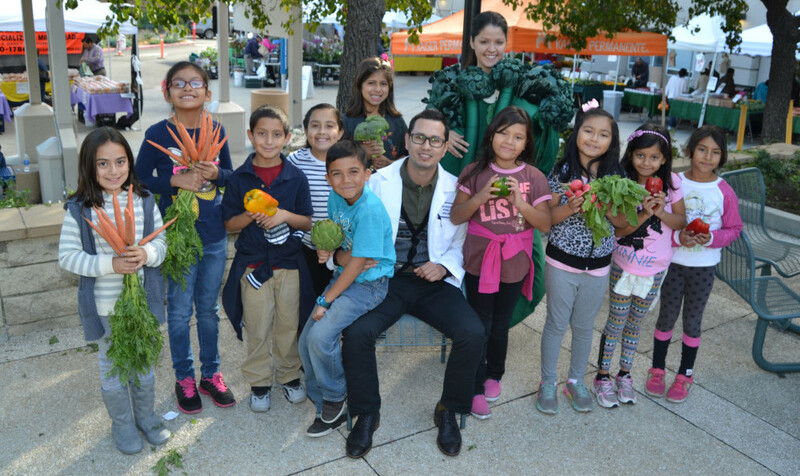 In Michigan, doctors are prescribing fresh, local vegetables and produce through the Health Rx program, which launched in 2013 as a community benefit of Detroit’s Community Health and Social Services center. In California, rivaling health systems are actually collaborating to improve diets. In the Bay Area, health care giants Kaiser Permanente and Dignity Health Clinics have joined with others in underserved neighborhoods in Richmond and Oakland. These hospitals procure a portion of their foods and other products from local farms and businesses, but also partner with organizations meeting the needs of food insecure families. Ten Bay Area hospitals buy more than 90,000 pounds of local produce annually—causing a ripple effect in the local food chain. Lucia Sayre, California regional director of the Healthy Food in Health Care program for Health Care Without Harm, says she’s excited about conversations taking place about how hospital systems can band together to make the “upstream investments” in community food and nutrition that have been spelled out by the Affordable Care Act. With the additional prodding from the federal government, we may start to see just that happen—in California, Massachusetts, and beyond. Photos, from top: Dr. Carlos Mendez of Kaiser Permanente is surrounded by third grade children from nearby Ranchito Elementary School. 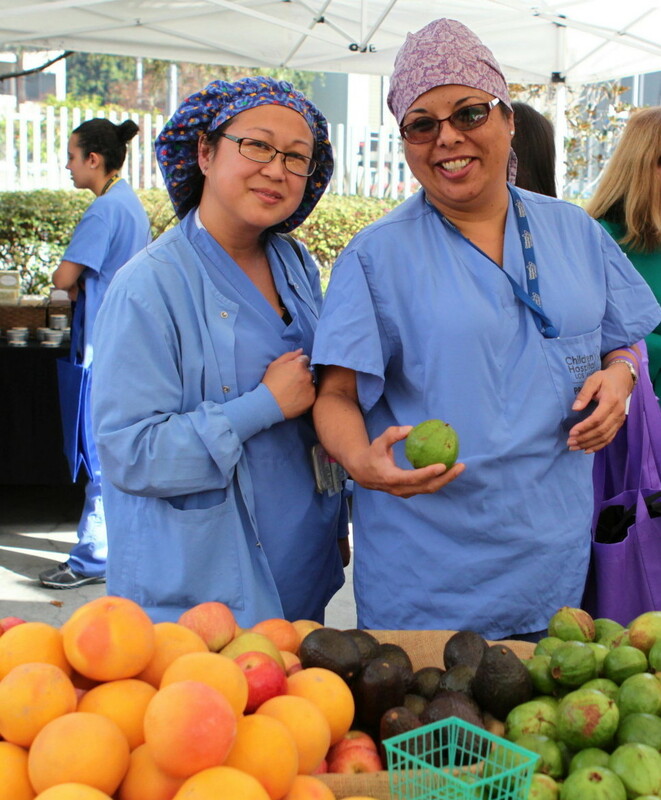 (Credit: Kaiser Permanente); Nurses and Children’s Hospital LA shop at the farmers’ market set up in front of the hospital (courtesy of Children’s Hospital LA). A true community service on the part of hospitals would be something like reducing addiction to prescription drugs or providing pro bono prenatal care or having trainees check in on the elderly in the neighborhood, you know, tackle some immediate problem with important health consequences, not just aping some dubious feel-good fad. Promoting fresh veggies is a nice trendy thing to do but it is also a cop out when hospitals are in a position to do more important work. This wishful "veggies will solve all problems" nonsense is being spread a little thin, don't you agree? Although community supported agriculture (CSA’s) and farmer’s markets have been in existence for quite some time, popularity amongst their availabilities to the public has increased throughout the US. This increase is largely due to the aims for addressing the needs of small farmers as well as alleviating community food insecurities (Allen et al. 2006). I argue that it is time for CHO to continue its pursuit in engaging social change in the food system by advocating the enactment of cottage food laws within patient menus and food retail sales. Implementing these laws will leverage food systems by a) directly supporting low income food-based business ventures which allows for extra income stability and economic growth within underserved communities in Oakland, while b) allowing patients, hospital staff, and guests to obtain more healthful and locally produced foods.